It’s been too long since I’ve done any Julia Child recipes. I had a few hours on a Sunday afternoon and a desire to cook up some fish that we brought back from our vacation to the Outer Banks. The filets were tilefish–meaty and mild, and they were well-protected in their freezer wrap but still, after a few months, you need to dress them up a bit. Julia, with her penchant for wine, butter, and cheese, had just the solution. This was a relatively easy dinner from Mastering the Art of French Cooking, and was just fancy enough to be special without being too pretentious. Melt 2 tablespoons butter in a skillet. Toss the mushrooms in the butter over moderately high heat for a minute or two without browning. Season with a bit of salt and pepper and set aside. Sprinkle half the onions along the bottom of a buttered dish that can be used on both the stovetop and oven (I have a cast-iron dutch oven). Season the filets with the salt and pepper and lay them across the onions in one slightly overlapping layer. 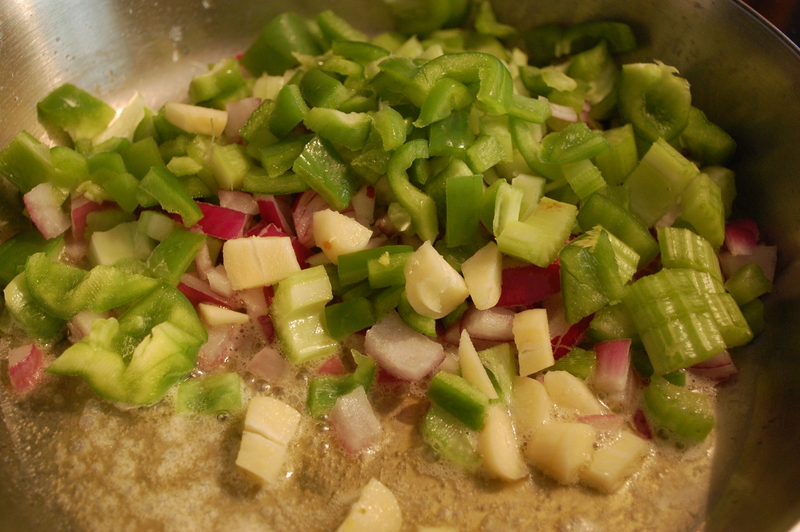 Sprinkle the remaining onions or shallots over the fish, then add the mushrooms, and finally the water and white wine. Bring the dish to simmer on the stove. Spray a piece of parchment cut to size on one side and lay it over the fish. Place the dish into the oven and cook until just barely done, 8-12 minutes, depending on the thickness of the filets. You’ll know it’s ready when a fork can easily pierce the skin of the fish but don’t let it get dry and flaky. Take the dish out and drain all the cooking liquid into a saucepan. Set the fish, still inside the dutch oven, aside, covered. Preheat the oven’s broiler. Meanwhile, bring the cooking liquid to a rapid boil and boil it down until it has reduced to one cup. Take it off the heat. 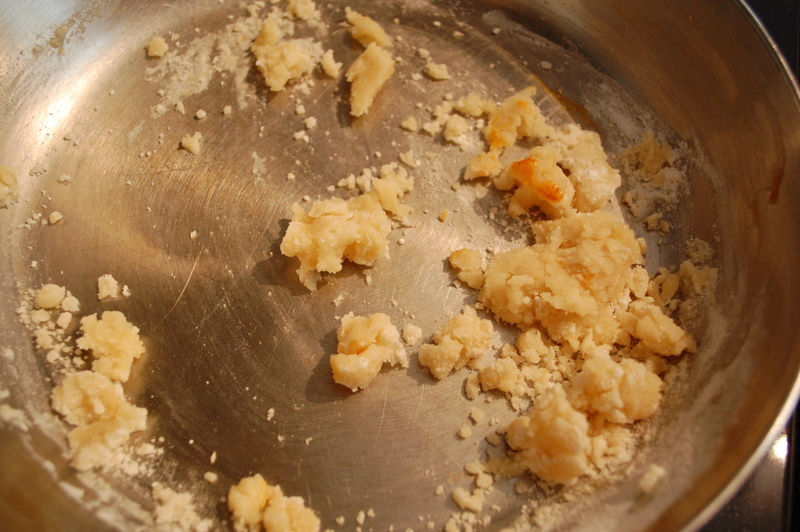 Meanwhile, soften the remaining three tablespoons of butter and beat it into the flour to form a paste. Beat that paste into the boiling, reduced cooking liquid, then mix in 1/2 cup of milk or cream. Bring that mixture to a boil. Thin the sauce with additional tabelspoons of milk or cream until it coats the spoon nicely. 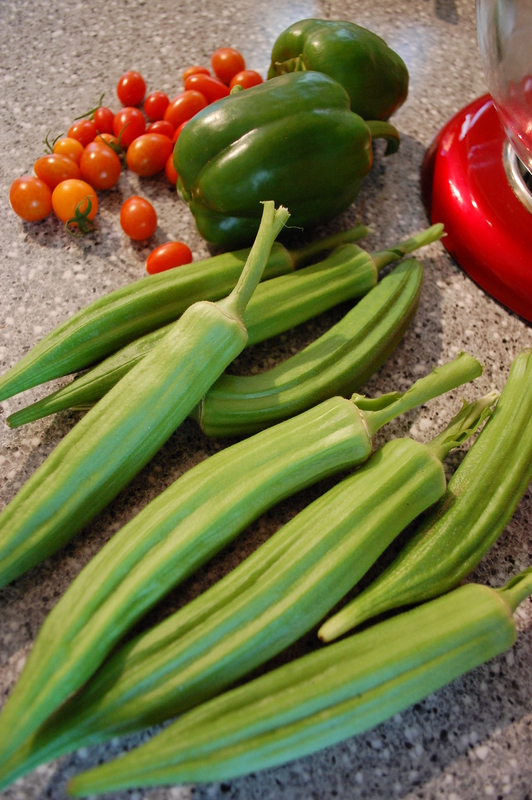 Season to taste and spoon it over the fish. Cover the fish with the cheese. 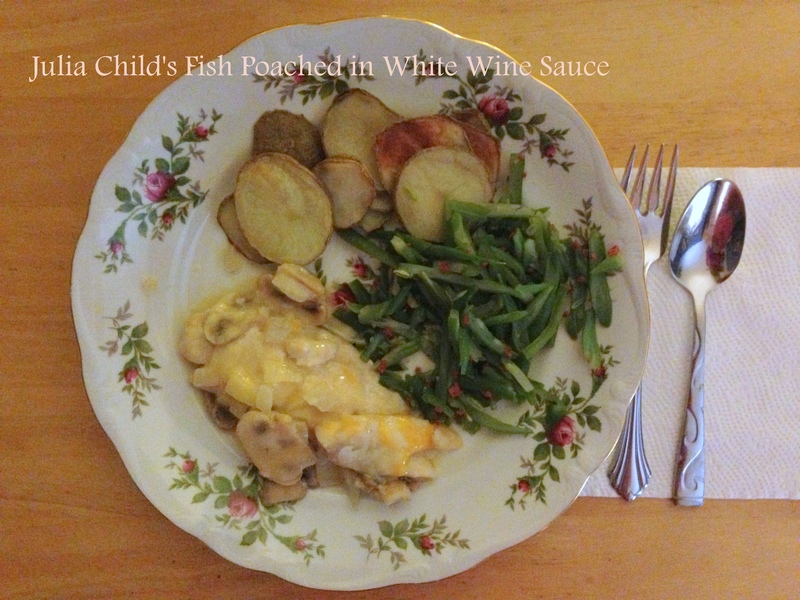 Place the whole cooking dish back until the oven, under the broiler for 2-3 minutes, just long enough to melt the cheese and reheat the fish. Serve as soon as possible. My life is complete again. Downton Abbey, Season Three, is now airing on PBS and I find myself anxiously counting the days until Sunday when I can get my next fix. 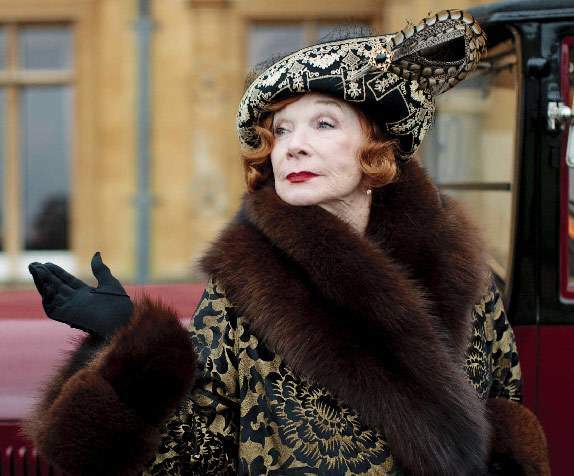 Like most Downton fans, I am deeply invested in the characters. Will Lady Mary and Matthew find everlasting happiness? Will Branson be accepted into the family? Will the Dowager Countess and Mrs. Crawley ever agree on anything? Will Lady Edith be anything more than the Marcia Brady of Edwardian-era England? I tune in each week, longing to know the answers to these questions but also for the exquisite costumes, the GORGEOUS estate, and…. the food. I’ll admit it. When a dining or kitchen scene is shown, I barely pay attention to the dialogue. My eyes dart through the room for glimpses of the cookware, the serving dishes, the stove, and the pantry. What’s on the sideboard? How are the dishes prepared and presented? This is where my attention is focused. Sorry, Downton writers. 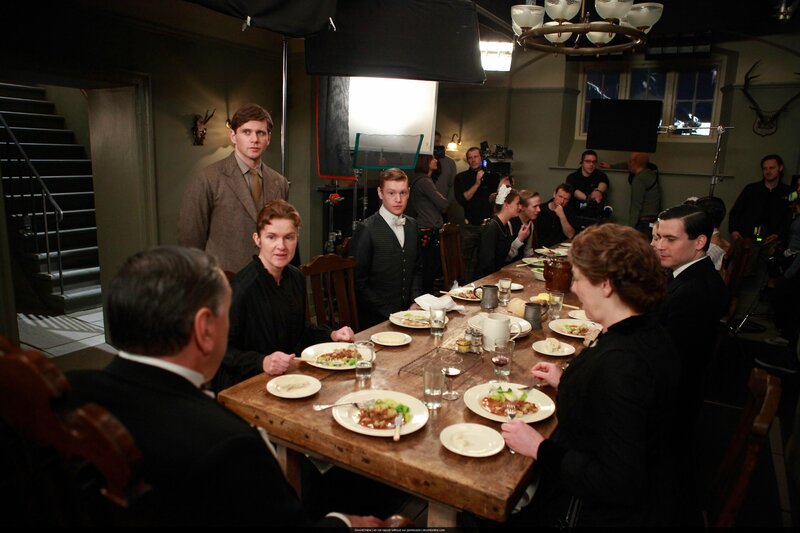 The servants of Downton have their own communal table where they have meals after the family has been served. On premiere day, I needed something to keep myself occupied or I knew the hours would drag until 9 p.m. 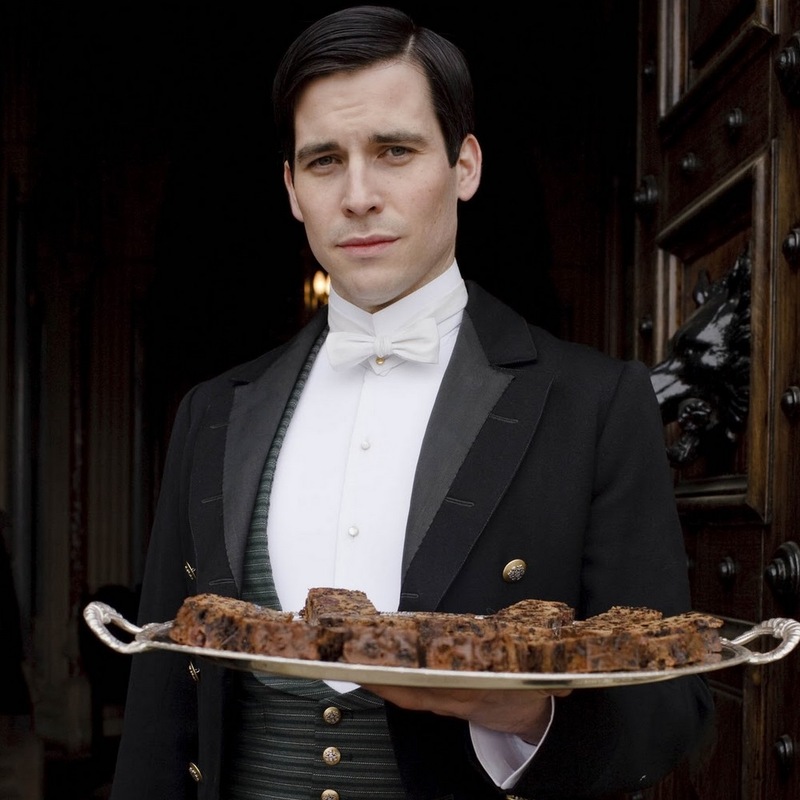 So, I made Downton-era food… four recipes, which I’ll be sharing over the course of the next two weekends. As we enter Season Three, Downton’s plotline has moved into 1920. I admit, I’m not a fan of this decade. The dresses are formless, the hair is shorn and bobbed, and all I know of 1920’s era food is what I’ve learned from reading F. Scott Fitzgerald, with his description of tomato sandwiches, salad and gin. It always seemed to me that the 1920’s were an era of light food and heavy drinking. But the 1920’s America of Fitzgerald’s depiction is different than the England of the 1920’s. The people of Great Britain are rebuilding after World War One and the old money families are struggling to maintain their way of life and traditions in a new age where class and upbringing are beginning to be of less importance. Mrs. Patmore, Daisy, and new footman Alfred. 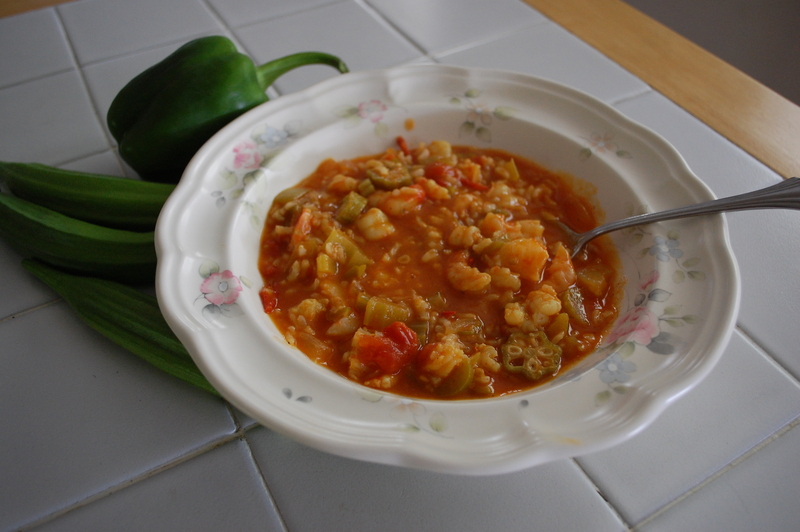 I went looking for recipes mainly from the 1920’s to share with you. Three of these come from my fabulous Christmas present cookbook, “Heirloom Cooking with the Brass Sisters.” Marilynn and Sheila Brass are collectors of vintage recipes, both in book form and handwritten, and they date each recipe by decade. 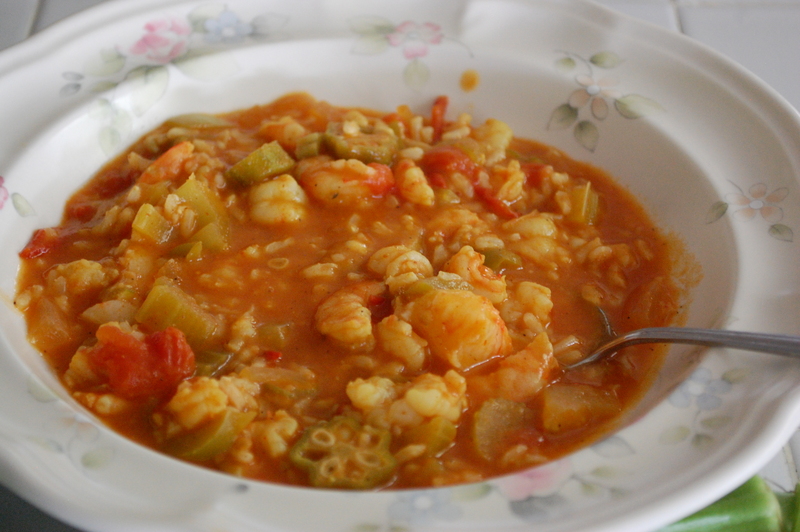 The fourth recipe is from the Downton Abbey Cooks blog, which I highly recommend to fellow Downton-lovers. 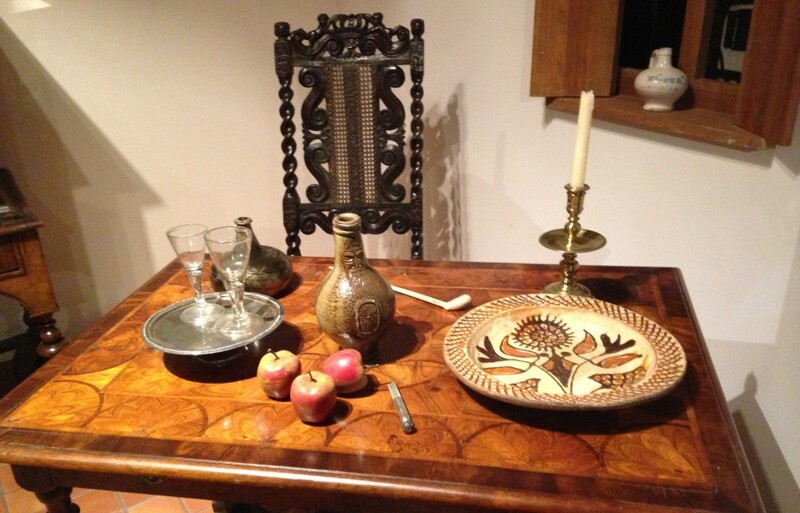 And for a fabulous article about that blog’s author and the food, the kitchen, and dining room of Downton-real and fictional-click here! We begin with Salmon Squares. I picked this because it sounded delicious-and also because I imagined it would be a luncheon request of Countess Grantham’s American mother, played by Shirley Maclaine. It’s sophisticated, rich, and presents beautifully. I suggest it for your next Sunday dinner. It is labor intensive-but well worth the effort! It makes nine servings. Countess Grantham’s mother, played by Shirley MacClaine. Set the oven rack in the middle position. Preheat the oven to 350 degrees. Coat a 2 quart, 8×11 inch ovenproof glass baking dish with cooking spray. 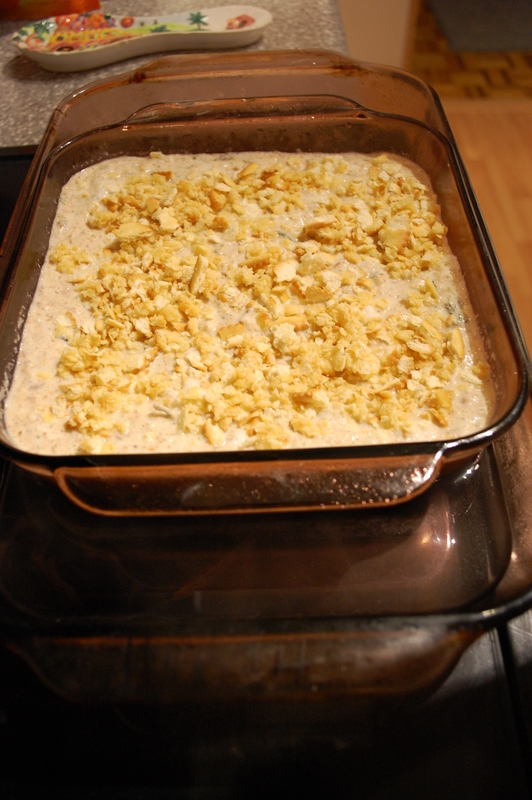 You’ll also need another pan in which to set the baking dish to create a water bath-I used a glass 9×12 inch pan. Set a kettle of water on to boil. Place bread crumbs in large bowl. Put milk in a microwaveable mug and heat in microwave for about a minute and 15 seconds, until hot but not boiling. Pour hot milk over bread crumbs. Add egg yolks, mix, and set aside. In a medium size bowl, combine rice, cream, salmon, onion, 4 tablespoons of the melted butter, 1 ½ tablespoons of the dill, parsley, salt, pepper and paprika. Add to the bread crumb mixture and stir to combine. 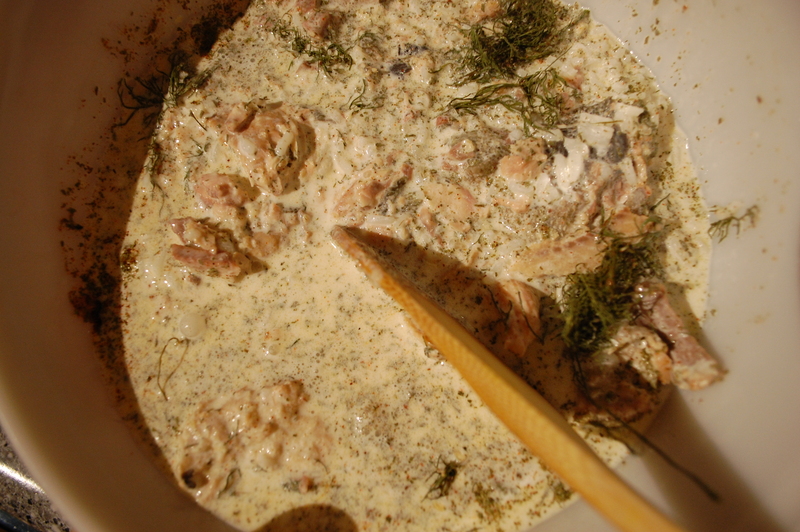 The cream, salmon and dill step. Anytime there is cream in a recipe, you know it’s going to be good. Beat egg whites with mixer until soft peaks form. Fold egg whites into salmon mixture and transfer to prepared 8×11 baking dish. 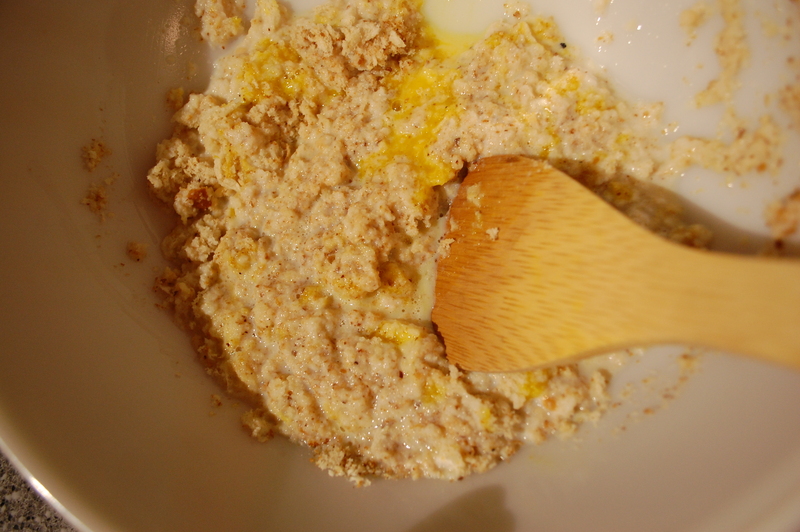 Mix the remaining 2 tablespoons melted butter with cracker crumbs and sprinkle over top. Place 8×11 dish into the larger dish. 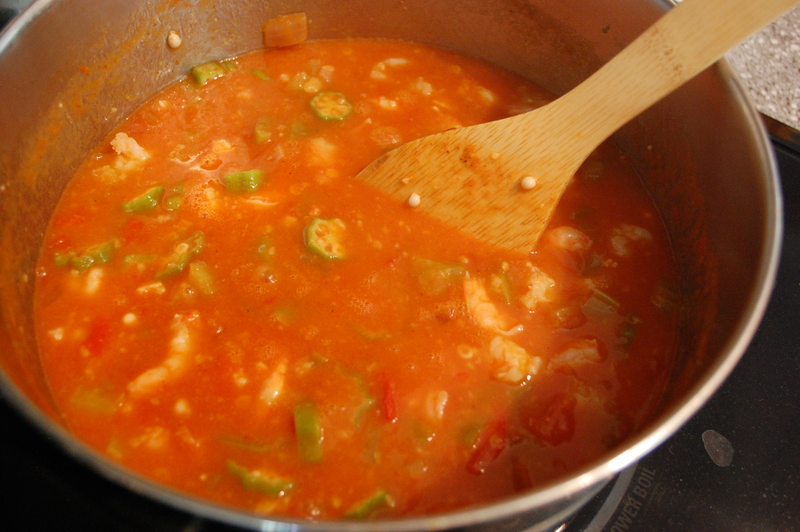 Pour boiling water into the larger dish until it comes about halfway up the sides of the 8×11 inch dish. Cover the entire thing with foil and place carefully into oven. This was difficult to illustrate but you can see the 8×11 pan inside the 9×13 pan, which is half filled with water. So basically, you bake and steam your salmon. Bake 30 minutes. The recipe says to check the water periodically to make sure it doesn’t evaporate. I didn’t see any water evaporation at all but I use an electric oven and in a gas oven, the water may evaporate-so keep an eye on it. Replenish as needed. After 30 minutes, remove the foil and bake an additional 30 minutes or until a tester inserted into salmon comes out clean. 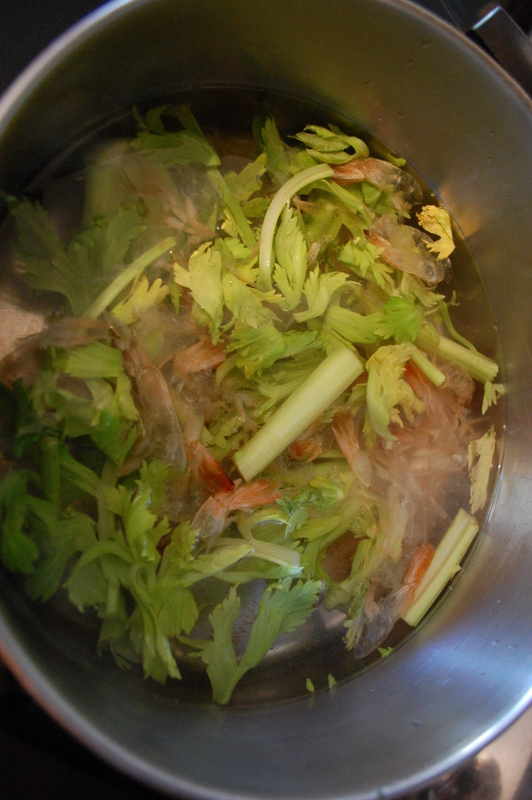 Remove from oven and the water bath and let the dish cook for about 10 minutes before serving. Meanwhile, mix the mayonnaise, three tablespoons of the dill, lemon juice, and sugar in a bowl. Cut the salmon into squares and serve with a dollop of the dill mayonnaise. Enjoy! 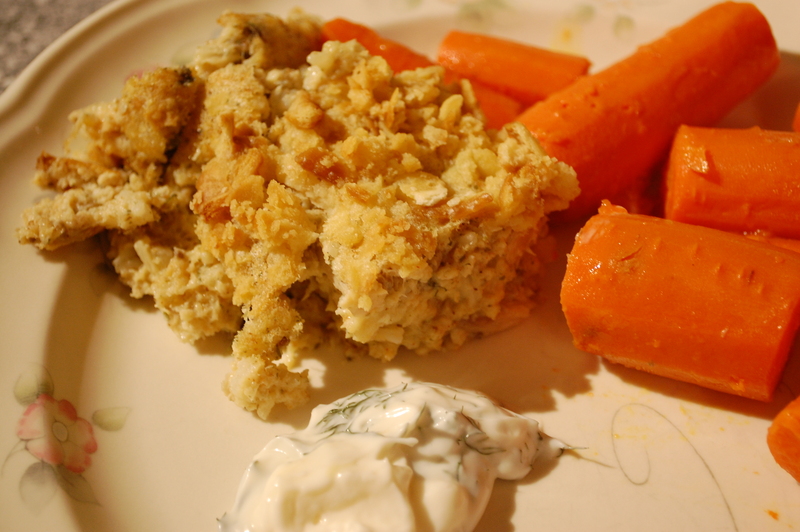 The salmon squares with the dill mayo, and a little carrots on the side for color.